Have you ever heard of the Charleston plates? Have you ever heard of the Charleston plates or the ‘Famous Women Dinner Service’? I hadn’t until recently, and was intrigued when I did. This was a fascinating collection of 50 plates that were commissioned in 1932 by Kenneth Clark, art historian and presenter of the superb TV series Civilisation. 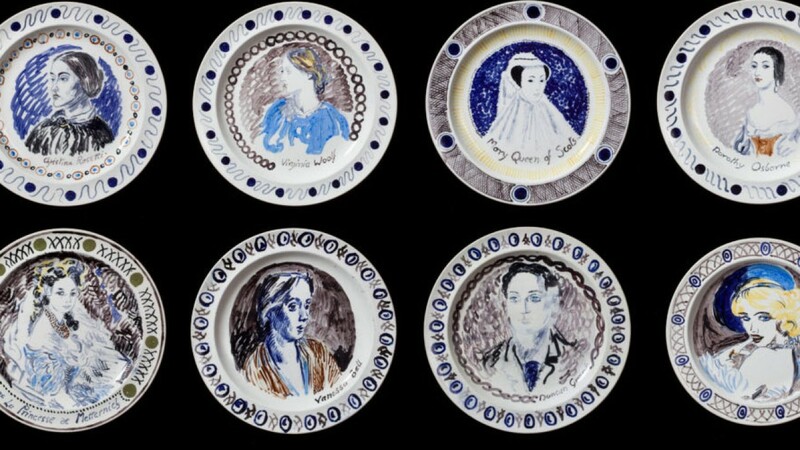 He asked Bloomsbury artists Duncan Grant and Vanessa Bell to create a set of dinner plates, leaving them to choose the theme. The one the two artists came up with was ‘famous women’ and on Wedgwood creamware they painted portraits of queens, dancers, actresses and, most importantly, they included writers. Vanessa’s sister Virginia Woolf is there, so are Sappho, Lady Murasaki, Germaine de Stael, Dorothy Osborne, Charlotte Brontë, Christina Rossetti, George Eliot, George Sand, Elizabeth Barrett Browning (with her dog Flush) and, most importantly, Jane Austen. Dante’s Beatrice is included as a literary muse. The portraits are very ‘Bloomsbury’ in style – whimsical, with loose brushstrokes and at times quirky. Each artist painted half the set. The artists did 48 pictures of feminist icons, and then included pictures of themselves, so the only ‘male’ plate is of Duncan Grant. The plates are considered an important work of proto-feminist art. The set went to Kenneth Clark’s second wife after his death. She took them to London, and they were then packed and taken to Germany by her daughter from a previous marriage. She sold them to a dealer and after that, they seemed to be lost. Then, about ten years ago, they were spotted in someone’s London kitchen, sold again to an art auction house, and they are now the property of the Charleston Trust, the museum home of Duncan and Vanessa. Before going to Charleston they were displayed in London where they attracted huge crowds. The plates have been valued at £1 million for the set, so the Charleston Trust had to do some rapid fundraising, but they are now on display in a new gallery there. I’d love to be a patron of the arts like Sir Kenneth Clark and commission a dinner service, but mine would feature only writers, male and female. Choosing just fifty would be the hard part, but it would also be fun working out who to include. Who would you choose to have on your dinner plates – authors, royals, musicians, painters? Share your thoughts by leaving a comment. Wouldn’t it be gorgeous to host a dinner party with the Charleston plates. I hoped that Charleston might make replicas and sell them in their shop – I’d buy the Jane Austen one of course – but there doesn’t seem to any sign of them doing so. I am going there in May so will suggest it. Loved your choice and of course totally agree with John’s selection of Johnson and Boswell (and perhaps Hodge could have his own plate too?). That is very interesting. Have you read Vanessa and her Sister? It’s written from Vanessa Bell’s perspective and was very good. Yes, I really enjoyed it. It was well written and an interesting novel.